I was craving spiced cake donuts of all things during the Super Bowl last night... Of course dairy and gluten free donuts aren't one of those things that you can run out and grab just anywhere. I had made Sarena's Baked Cake Donuts before and enjoyed them. However, I wanted donuts with some spice to it and I didn't have all the necessary ingredients to follow her recipe exactly. 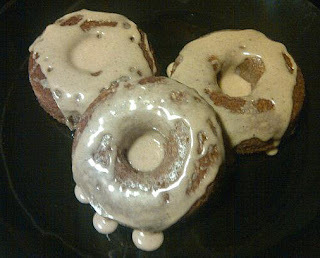 I spiced these donuts up with nutmeg and cinnamon which was perfect for what I was craving. I also switched up the sugars, flours, and milk based on what I had on hand. These donuts were simple to put together and were ready to be eaten in no time flat! Prepare your donut pan by spraying well with cooking spray. Mix together the sugar and buttery stick. Combine the flour, baking powder, baking soda, salt, and nutmeg. Combine the coconut milk and vinegar. Slowly add the milk to the batter. Divide the batter evenly into the 6 wells of your donut pan. Allow to cool for a few minutes then turn out the donuts. While the donuts are cooling, combine the powdered sugar, cinnamon, and vanilla with just enough coconut milk to form a thick glaze. Dip the donuts into the glaze or spoon glaze over donuts and serve. Thanks Sophie :) They tasted amazing! I hope that you try them. Had allergies and strange health problems? Could be tied to milk…bet you don’t know as much as you think you do about the dairy industry and the harmful effects of milk on the body. Got the facts on Milk? (also known as “The Milk Documentary” is an entertaining, award winning feature documentary that dares to question the conventional wisdom of the much publicized health benefits of milk and dairy products. Addressing myth, truth and all in-between, the film is a humorous yet shocking exposition that provokes serious thought about this everyday staple. Definitely worth checking out! There are some amazing facts in here that will blow your mind! Please check it out and pass it on, let’s spread the word! My son would love to have these donuts in his next college care package. Do you think they would survive being mailed? It would take about 2 days to reach him. Thanks!